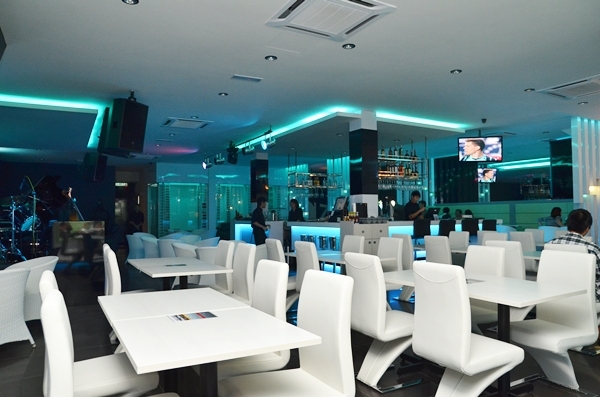 The interior of Gossip Jazz; with a stage on the left and the bar in the middle of the premise. IMO, the spaces between the dining tables should be expanded slightly to accommodate a larger crowd during peak hours. We first received notification about this new place about a month ago. Flyers were distributed around town and noise level was increased in a viral approach through social media (join their Facebook page for updates). Another new fusion cafe in town would have created mere splatters, but a new jazz+blues lounge+restaurant generated ripples and waves of excitement. Btw, the only other jazz bistro in town has got to be Denis Jazz Bistro in Ipoh Garden, a stalwart of an establishment with more than 5 years in business, and still going strong. Conventional assumptions towards a wine bistro serving good food sparked reservations; as the flyer featuring shots of Sang Har Mein, Lamb Shank and Tenderloin Steak could not entice me enough to call for immediate action. However, on a rainy evening yesterday left with not many choices around Greentown (picky I know, but knowing me …. you would understand why I seldom visit the same place if I can avoid it), I suddenly remembered Gossip Jazz somewhere around the vicinity. A quick search for information on their page revealed that yes, thankfully they have started business about a week now. The next question was, where exactly is the location? No thanks to a dreadful 3G connection around my area (deteriorating from bad to worse, really), we were left fending for ourselves by taking chances around the business centre. After all, how big can Greentown be? 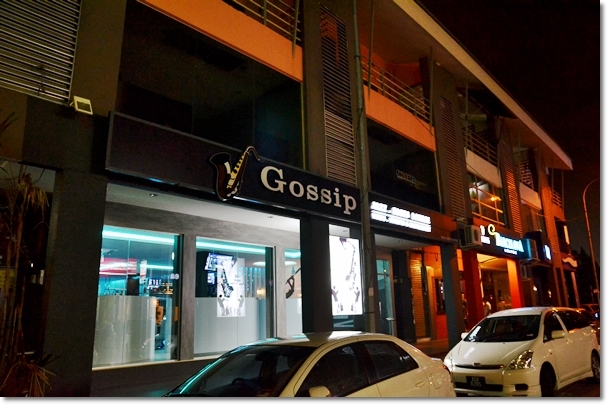 Gossip Jazz is in fact, located along the same road as the Maxis service centre, directly opposite of SnowDream and the ex-Dubliners Cafe. Map to come at the end of this post. The psychedelic neon-blue lighting and the bar-like setup with a stage placed with various musical instruments stopped us on our tracks. Not to mention the three semi-spherical structures housing three tables with lime green cushioned seats lining the perimeters of the restaurant. Then we browsed the menu placed on a pedestal on the outside, and a very pleasant staff coming to our aide. 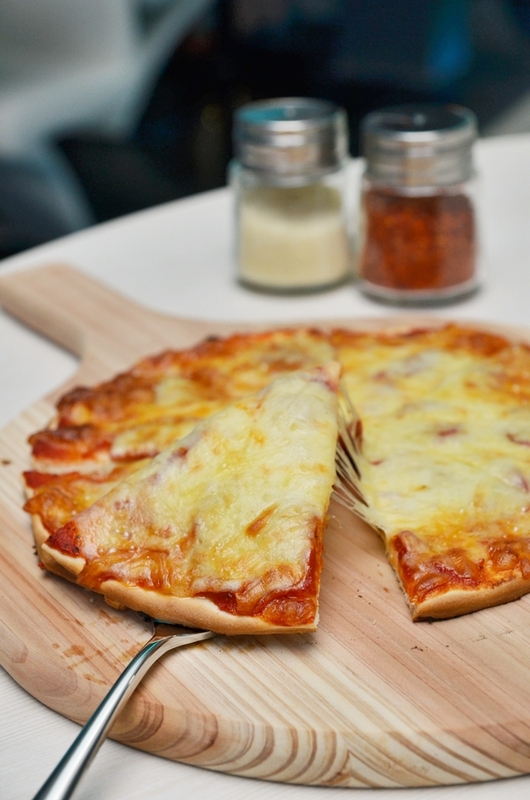 Pizzas, pastas, lamb chops and steaks, grilled salmon, nasi lemak and Hainanese chicken rice, light bites that no doubt go well with their extensive selection of wines and spirits, as well as Illy coffee (!) priced at no more than RM6 per serving. 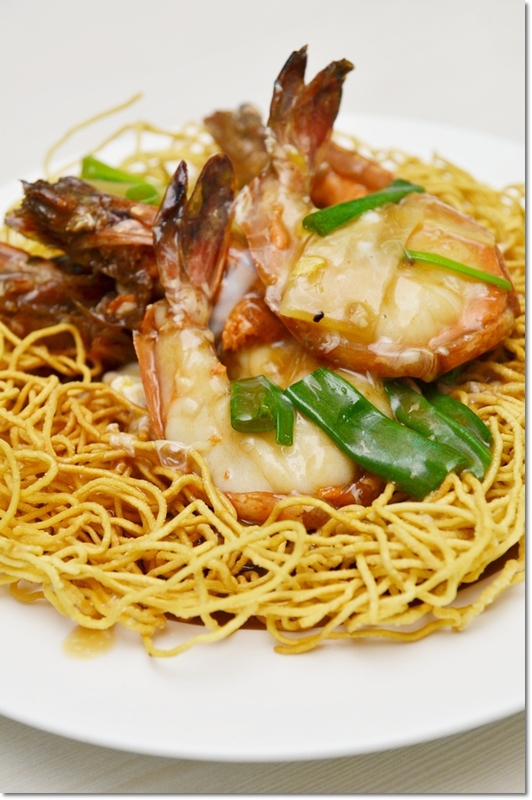 The Sang Har Mein arrived with two huge and succulent freshwater prawns lying on top of a bed of crispy deep fried egg noodles garnished with chopped spring onions, and a pool of sumptuous gravy without the starchy texture. To find a place that serves good Sang Har Mein in Ipoh can be akin to finding a needle in a haystack (enlighten me please), and so far, Gossip Jazz laying stake to the BEST in Ipoh could be not far from the truth. 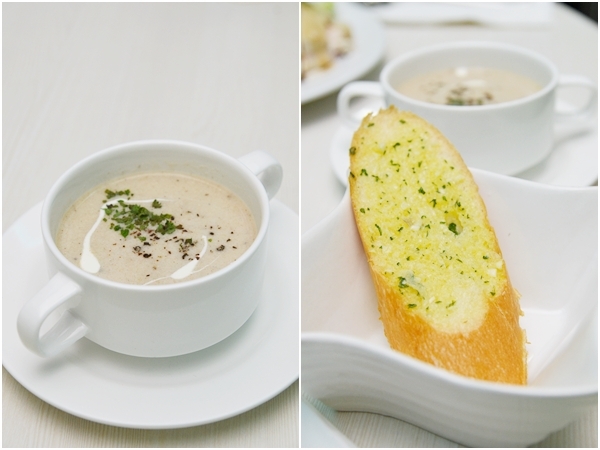 The cream of seafood soup fared less impressive; bogged down by the saltier than desirable taste. However, they took it all in stride when the feedback was given. And did I mention about the level of courtesy and prompt service? Excellent from the moment we were seated until we settled the bill. Kudos, for you know how some new eateries hire cheap part-timers and throw everything else out the window. 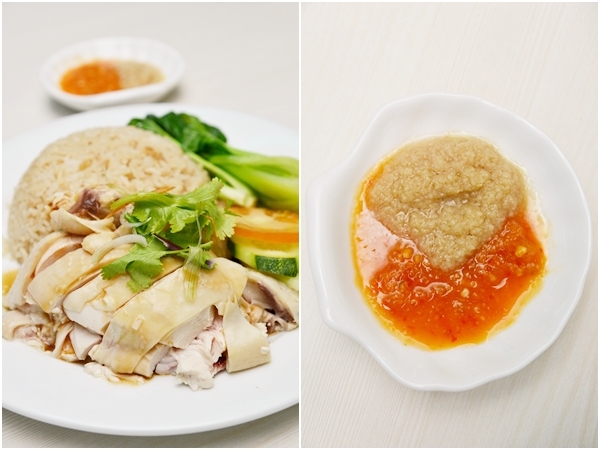 If you can get over the fact that their Hainanese Chicken Rice (RM13) is priced at almost triple the price charged at your neighbourhood chicken rice uncle’s stall, then you’re in for a treat. The fragrant rice was almost devoid of oil; a definite winner in my books. And sizeable portion was served too, complemented by blanched bok choy and of course; a generous cut of poached chicken. The chili sauce with mashed ginger deserves a mention too; and we ended up calling for seconds (no extra charge for the sauce). The pizza arrived last, but it was a bearable wait (not more than 15 minutes) and definitely took me by surprise. Half-expecting a miserable attempt of canned tomato puree smothered on a tasteless dough base, the thin crust pizza with a molten of melted mozzarella over beef pepperoni and relatively fresh tomato sauce was scrumptious. This made me eager to return for the other 3 flavours on the menu; especially the Chicken Pepper Pizza. 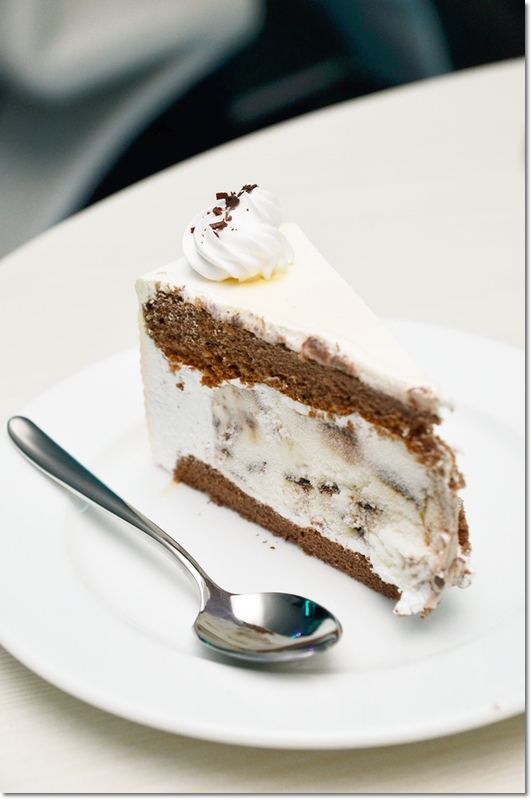 We capped off the meal with a slice of Ice-cream cheese cake, a recommendation of the waiter tending to our table. The spongy-light chocolate cake sandwiching a layer of ice-cream was not so sweet, but was just passable. Since they only have three types of desserts on their list (the others being a Banana Split and one serving of 3-scoops of ice-cream), I suggest that you give their starters and mains more stomach space, while leaving some for the coffee, or of course … their mind-boggling selection of liquor. 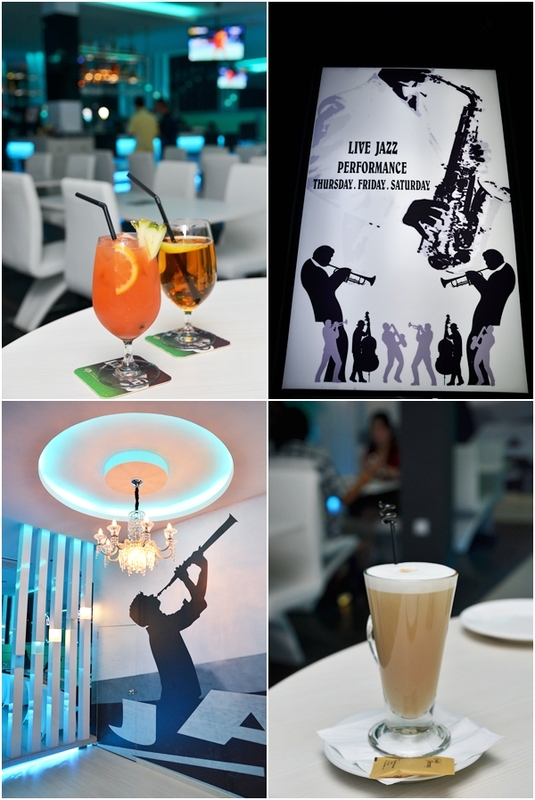 They only host live jazz performances on Thursdays, Fridays and Saturdays from 9pm onwards. We have not borne witness to the performance while we were there, yet this place does hold promise for a slightly lacklustre night scene in Greentown of Ipoh. When all else failed, you can still take comfort in their food. Was really tempted to try the Roasted Lamb Chop (about RM25) or the Australian Tenderloin steak (about RM32), yet I have had enough of red meat for the entire week’s quota. Join me for next round then? *Gossip Jazz will be having their official launch this Friday (26th October 2012) from 9pm onwards. Guest of honour is none other than Jack Lim; the MyFM DJ better known for his other persona … “Ah Beng”. No invitation necessary. Please don’t go to this place. The food served here is horrible, tasteless and not fresh. Their ‘Best Sang Min’ was horrible, the worst I ever eaten – not only were the prawns not fresh, but the noddles were not crispy, tasted morelike exposed noodles in the air type. Juices were not fresh – when I asked the waiter were the juices freshly squeeze, he said yes, but when my friends and I ordered, was from the packet and I requested no sugar but the juice had sugar. The lamb shank was very salty and who puts white radish in the lamb shank? Carrots were hard and so were the radish. The Hawaian Pizza was terrible. The pizza base was like biscuit and the tomato base sauce was too sour and the toppings were scarcely. The fried calamari was disappointing. The picture in the menu showed fresh mini calamari being fried, but what we we served was frozen battered calamari being deep fried, tough and tasteless. Overall, wouldn’t recommend this place for dining. Very disappointing. May I know what type of qualitification you have? Please assist.Thank you. Food need to be try out before he/she have the right to comments. Please don’t just comments without any sense. Yes the food is a bit salty but not terrible as he/she said. Why must he/she have such an sick heart. I have eaten at this Lounge, the food is good and simple to eat not like others place which do business by so many type of foods, once the place full everything is tasteless. Gossip Jazz’s food, environment, wine etc is recommend to you as a dinning place. I’ve personally tried the food there myself….wonderful sang har mein…the noodle was crispy..something very different from others. The European duck was impressive too…I’m not a duck meat lover but I end up loving it. Really worth trying it. I think we must not forget about the concept of this outlet…where can you find such a classy jazz lounge with a variety of good food and wine with live music in Ipoh? Even some KL outlets might not be able to provide so. Some ppl must learn to be more matured in giving comments. I am a true blue Ipohan. With my family in the food business industry for 10 over years (owned a cooking school and a buffet catering business some time ago), I have a well trained and also very picky taste bud. Having living in the Europe and Singapore for some time, I am now back to Ipoh for a while. I am pretty exposed to good standard of western food but also spoilt by the high standard of street foods in Ipoh. Having read the review by motormouth, I’m pretty suprised for the fact that firstly, either Gossip did a paid review, or that the QC and standard of the food in Gossip has gone down so bad in just 2 weeks time. I’m here to back Suave Elle’s review. Gossip is lucky to be saved by the band, the jazz band is awesome and the only reason we stayed on! We ordered the so-called The Best Sang Har mein and with the price tagged at RM25, you would expect at least to get a good handful of fresh decent size prawn. But nope, the prawn is as fresh as the ones you get after you refrigerated it for a week. And yes, the noodle is as bad as described by Suave Elle, stale. Second dish we ordered, spaghetti bolognese. Seriously, the basic of all spaghetti and I didn’t expect it can be screwed up big time as this. The beef in the sauce tasted so rancid that I couldn’t helped but have to ask to change it. I normally do not like to waste food and it’s really edible, I would just finish it up. So this showed how bad the bolognese was. And of course, they break the number one rule of making spaghetti – overcooked spaghetti! Third dish was the soup of the day. One would have thought, who can screw up making a soup right? Well apparently Gossip did. The soup is tasteless as sky juice. I’m not being exaggerated. Oh yes at the end, we gave up ordering food and ordered a bottle of wine that comes with free platter of cheese – well guess what, more like dry plate of overexposed cheese. I don’t have high expectation of western food in Ipoh ( but of course there are couple of really decent nice ones around ) but really, who bothers eating western when the good ‘old street foods in Ipoh is so freaking damn good and still prepared and preserved in an authentic way? But for the price they are tagging in Gossip, they have better really just stick to asian fusion food or upgrade their standard of western food. But again I reiterated Gossip is saved by the jazz band! The band is a very experienced jazz band who have performed in Macau, Penang , SIngapore and some other places. Great vocalist with great voice, along with awesome pianist and saxophonist! I hope motormouth paid a second visit to the place, else would probably risk tarnish your reputation as a food blogger. To sum up, go to Gossip for the music but stay away from the food. You are warned. Thanks for the feedback. This is shocking. And to begin with, no. This was not a paid review, nor even an invited one. The Sang Har Mein we had was good, not exceptionally good but definitely one of the better ones in Ipoh. Fresh prawns (two of them) and noodles that was bouncy and served in sauce that was sumptuous too. The soup was forgettable, but the chicken rice was above average like how I wrote. It’s a jarring difference comparing your experience to mine, as yes, I do agree that Western food in Ipoh might be lacking compared to 5-star hotel fares in KL, Singapore or even in European countries. But there are good ones that have stayed strong until today. having a top notch live jazz band ain’t gonna cut it. Quality of the food must be there, coupled with excellent service. Once again, reputation tarnished or not, I stand by my views during the first visit, Grace. Maybe a second visit would be timely. Last week I came back for holiday from KL. As I have grow up in KL and have much KL lifestyle, I think Gossip’s food, environment, entertaiment etc., can compare with KL lifestyle. Their Sang Har Mee have the taste that I use to eat at KL Life Centre which was above few years ago. The duck dishes taste good too and the Lamb shank. Maybe you should try the Lamb chop too cos the meat cooked according to our requirement. A bottle of house pouring red wine is not that expensive compare to KL. It is quite affordable for Ipoh lifestyle. Yeah motomouth & all about ipoh should paid a visit to Gossip…..cos comment from ‘ill hearted people’ or ‘competitor’ cannot just accepted as is it without survey. I agreed with jennifer comment cos my family and i just try the food yesterday at gossip. We like the environment so much and their red wine too cos in Ipoh you can never find a place for dining with such atmosphere. As we just have the red wine with the snack, we feel that the snack is a good choice for people who like to drink wine cos its go along together. Try the ‘Kronenbourg Blanc 1664’ too, it is very cold and refreshing beer. Don’t worry GOSSIP JAZZ, comments won’t ‘kill you’, we will sure give you a full support and will bring friends to Gossip during Devali holidays……. yes…gambateh Gossip Jazz…..there are still a lot people out there who have not come accross your place yet……don’t worry too much. yes in ipoh where can you find such a place like gossip jazz…..food no problem…..’human make mistake but human also can improve…..
all i can said ….. never try never know…..
Chris and William, I am not a competitor, I am just a normal person who goes around Ipoh, finding good places to eat. I am not even in the food line. It was a disappointing trip there and I am sure the waiters themselves know who I am, because when we did not finish the food served and about to leave, one waiter even asked me why. Please don’t simply accuse others for giving their honest feedback. If the place is good, I will certainly recommend. What is the point of lying? You sound more like the ‘owners’ then people who just give their honest feedback on Ipoh food. Good point Suave Elle. I am sure the owners will treasure feedback, positive AND negative ones. Suave Elle, thanks for sharing with us readers on what is bad at Gossip. But to the extent of starting your comment with ‘Please don’t go to this place.’ is a bit too critical. We will definitely avoid those food you have commented or even try it out ourselves if it is really that horrible. I tried their Cordon Blue. It was good.. Maybe different people have different taste of their favor. when I first stepped in feels so relaxing , comfortable yet good atmosphere…foods are excellent no complain. service are awesome …prices so far is quite reasonable…well worth the price . so far wat I’ve seen n tried western foods in ipoh, Gossip is da best. I will go back again.. I try the Kronenbourg Blanc 1664 it was not fresh like last time. i just wana asking all review guess or food critic …what customer really want in ipoh western cusine? I love jazz music…esp live Jazz. I went to check out this place. Food is rather small portion and nothing to shout about. Live jazz music has currently stopped until further notice. What a disappointment! This place has lost its signature. Live jazz has stopped? Seriously?! That can’t be good. The place is rather quiet even on a Saturday evening, from what I heard. How to choose a trumpet mouthpiece. the many attempts at finding the perfect mouthpiece. and a rim that feels just right. Oh yeah, it also must PLAY ITSELF! understanding about how to pick what will work for you. Getting that good fit is so important. Music wise, this place serves up anything BUT jazz. A saxophone or a few lame tunes of Kenny G (yeah, cringe-worthy, I know) does not a jazz club make.